(Casa del Vento) Didn’t My Lord Deliver Daniel? Da / From " This Is My Truth, Tell Me Yours"
La frase-monito per l'attuale generazione, che non puo' combattere una guerra. Il "ritornello" e titolo della canzone si riferisce allo slogan del poster dei repubblicani spagnoli del tempo "if we tolerate this your children will be next"
This is about the Spanish civil war, and the idealism of people from around the world who volunteered to join the International Brigade Franco's fascist army, hence the line, "So if I can shoot rabbits, then I can shoot fascists." The title of this song does indeed relate to the Spanish Civil War, but to the best of my knowledge more specifically to the Communist leader Dolores Ibarruri or "La Pasionaria", who appealed to the French government to come to the aid of the Spanish Republic against Franco and Fascism during the Civil War . This they failed to do and a short time later France was under the occupation of Nazi Germany, thus the title of the song. -Alan, Cork, currently living in Spain. More recent anti-terror campaign posters have also drawn inspiration from this - in 2001 posters were strewn all over the area near to Wales' National Assembly buildings in Cardiff concerning the war on Iraq, with the caption: "If you tolerate this, your children will be next... And if your children tolerate this, there's NO TELLING WHO'LL BE NEXT!" 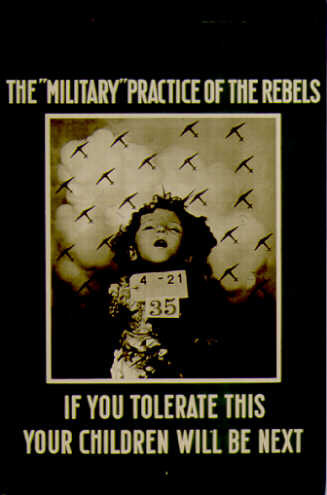 The title comes from recruiting posters used by the Republicans in the Spanish Civil War. They showed images of carnage caused by Francos's Nationalists with the strapline "If you tolerate this your children will be next." "Remember Mitchy's party? Well there's a baby on the way". allora posso sparare ai fascisti. ¿o es tal vez vergüenza?